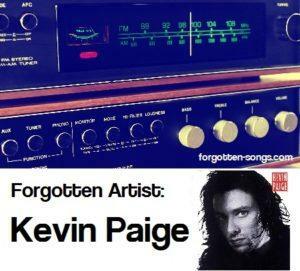 As is often the case for a forgotten artist, not much background information is available online about Kevin Paige. According to AllMusic, he was born to a former radio singer for NBC in the 40s. He spent time in a few local bands in and around his hometown of Memphis until he was signed to Chrysalis Records in 1989. Things were looking pretty good for Mr. Paige in 1989. That year, he released his eponymous debut album, which saw some chart success and led to a fair amount of airplay on top 40 radio. Per the inactive website Rare and Obscure Music, that success led to Mr. Paige’s opening for Debbie Gibson on her Electric Youth world tour that same year. 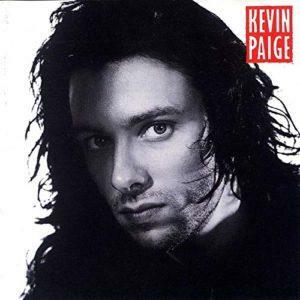 The first single from Kevin Paige was “Don’t Shut Me Out”, a song addressed to the protagonist’s would-be lover, who was apparently hurt in the past and doesn’t want to take a chance on love again. This debut single performed quite well for Mr. Paige, though its debut was rather inauspicious. It entered Billboard’s Hot 100 at #99 for the week ending August 19, 1989 (chart), and, after a long and arduous climb, it peaked at #18 over three months later (chart); it remained there for a second week before starting back down. In all, “Don’t Shut Me Out” lasted a fairly impressive (for the time) 24 weeks on the Hot 100; however, its long chart run was not sufficient to place it on the 1989 year-end chart. The follow-up single,”Anything I Want”, was the first track from Kevin Paige’s eponymous album. A song talking about not letting anyone hold you back from, well, anything you want. Specifically, Mr. Paige appears to be calling out haters who told him he could make the type of music found on his album because he was white. I guess he showed them. “Anything I Want” entered the Hot 100 while “Don’t Shut Me Out” was still on its way down the chart. The follow-up debuted at #82 for the week ending January 20, 1990 (chart). Its climb was quicker, as it peaked in its ninth week on the chart; unfortunately, its peak of #29 was also a bit lower (chart). From there, the single spent three weeks in free fall, lasting only 12 weeks in all on the Hot 100. A third single was released from Kevin Paige, but it missed making the Hot 100 entirely. For whatever reason, Kevin Paige never released a second album. ** Instead, he became a songwriter for Zomba Music Group while also becoming a staple of the live music scene in his hometown of Memphis. For about 20 years (off and on, per The Commercial Appeal), he anchored the house band at Alfred’s on Beale and, in fact, met his wife there. Nowadays, Kevin and Bethany Paige can be found working as music directors at the Catholic Church of the Incarnation in Collierville, a suburb of Memphis. They’ve released a couple of albums together as well. Of course, as is often the case with the dance hits of the late 80s and early 90s, classic hits stations have ignored Kevin Paige’s two hits. It would be nice to hear those hits back on the radio again. * I hadn’t remembered him either, until I came across this compilation album. ** No idea if this is related to that fact, but his label (Chrysalis) was in the process of being sold to EMI right around that time.